On 7 August 2012, members of the NDG distributed leaflets outside the train station in the morning to capture local commuters. 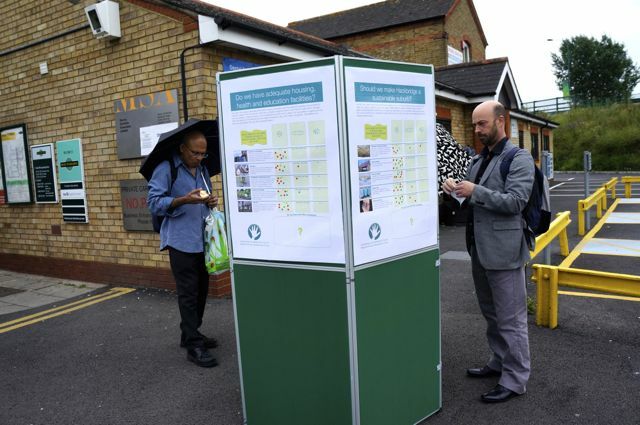 This gave people an opportunity to see what the NDG was all about and to be able to ask questions on their return journey when the NDG had set up their consultation boards. It was an incredibly windy day and there was no way the gazebo wouldn’t fly off, so we braved the elements along with the commuters to gather more information about what they would like to see in Hackbridge; what they like; what works and what doesn’t. We even had people still interested in completing the questions in the rain!